The Channel Islands Jersey, Guernsey and Alderney Are British...Or Are They? Great Britain - that part of the UK that includes England, Scotland and Wales, but not Northern Ireland - is surrounded by islands. Some, like the Isles of Scilly, off Cornwall and Orkney, off Scotland, are part of the UK. But others, in particular, Jersey, Guernsey, Alderney, Sark and Herm are independent states (sort of - as you will see) with their own governments, their own laws, their own unique history (during World War II,they were the only parts of the British Isles to be occupied by the Nazis), and an oddly tangled relationship with the UK. . The people of these islands, for example, are British subjects but not necessarily British citizens. Their UK passports do not give them the same rights to live and work in Europe enjoyed by UK citizens (a status that may change when - and if BREXIT - the UK divorce from the EU takes place). But they may, in fact, be entitled to a British passport if they have a parent or grandparent born in the UK, or if they, themselves, have lived in the UK for five years. In practice, that means just about everyone. How these islands arrived at their unusual status is a fascinating historical hiccup. Jersey, the biggest Channel Island at about 47 square miles, is 87 miles south of the UK and is considered the southernmost of the British Islands (the official designation - the "British Isles" being a literary and informal title). It is much closer to France than England at only 14 miles offshore. Jersey is a popular vacation destination, for its mild climate, long beaches washed by Gulf Stream waters, and unusual hybrid "franglais" culture. How this little bit of France became a Crown Dependency of the British monarch is a fluke of history. The Channel Islands were a part of the Duchy of Normandy and among the possessions William the Conqueror brought with him when he became King of England in 1066. For about two hundred years, the islands, along with Normandy and England, were united but the islands were administered from Normandy. In 1204, King John of England lost Normandy to the King of France. To keep the loyalty of the strategically important Channel Islands, King John decreed they could continue to be governed according to the laws they were used to - Norman law. As a result, a separate system of government was created with the British Monarch ruling as the "Duke of Normandy". Although the systems have changed over time, Jersey retains its separate-ish status. It is not part of the EU - though it has an associate relationship to facilitate trade. It is not subject to the laws of the UK Parliament, though UK currency is legal tender, and it depends upon the UK armed forces for defense. The official languages are English and French and there is a local patois that blends them both. Oh, and one last oddity - to islanders, Queen Elizabeth II is still considered the Duke of Normandy and referred to, by the island legislature, as "Our Duke". Jersey's main town is St. Helier. It's a large, lively place with lots of shopping and dining options. Like Jersey, Guernsey is a British Crown Dependency with its own government and an associate relationship with the British Commonwealth and the EU. Known for its seafood, its beaches and its yacht harbours, Guernsey, at 24 square miles, is the second largest of the British Channel Islands. It lies 75 miles south of the English Coast and 30 miles from Normandy. 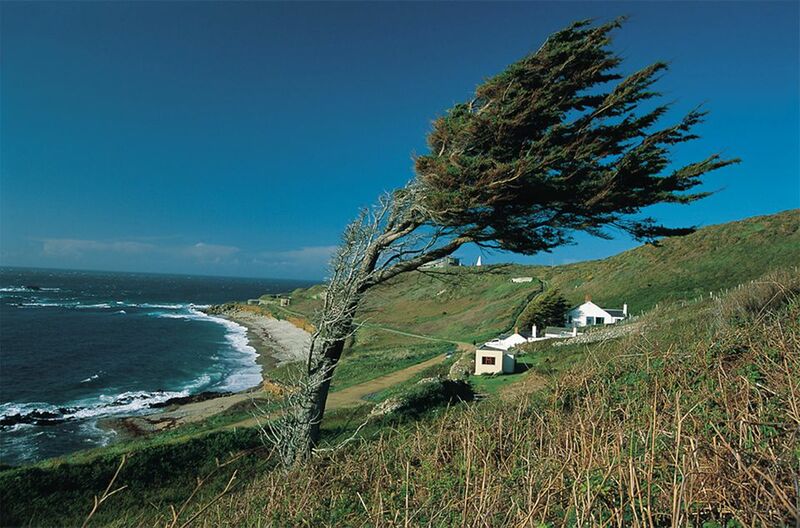 Guernsey has beautiful beaches, cliffs and cliff walks and areas of lovely rolling hills. It also has its own group of associated islands included in the "bailiwick": Alderney, Herm and Sark, a feudal state until 2006 and Europe's newest democracy. A bailiwick is an area governed by a bailiff. It's an ancient term and has little relevance today as most of the islands in this bailiwick have their own governments. Guernsey's main town is St. Peter Port. The book The Guernsey Literary and Potato Peel Society, about life on the island during WWII, recently made into a British film is fiction set in St Peter Port. 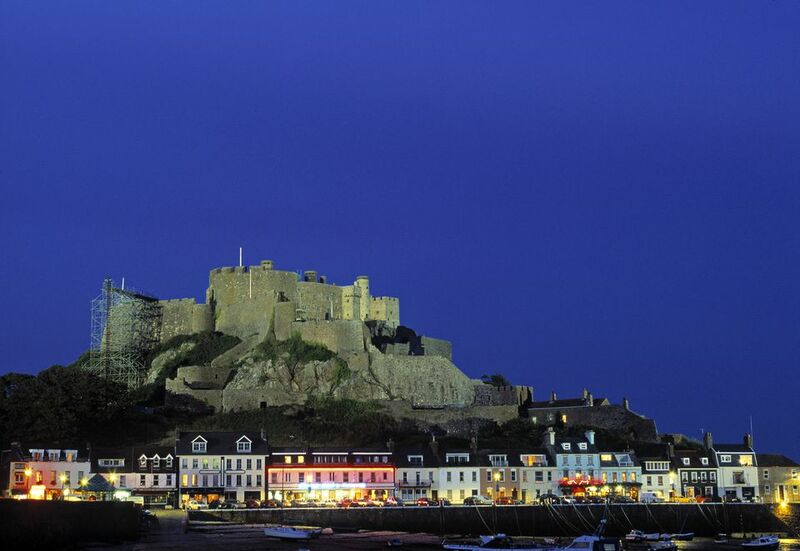 The port is also the location of the 800-year-old Castle Cornet, pictured above. Alderney is an unspoiled, natural island with a population of 2,000 noted for its traditional lifestyle, flora and fauna. It is 23 miles from Guernsey and only eight miles from the coast of France. Despite being only three and a half miles long and one and a half miles wide, smaller than both Jersey and Guernsey, Alderney has its own government, airport and port. It can be reached by scheduled flights from mainland UK, Guernsey and Jersey or mainland France. There are also scheduled ferry services from France and other Channel Islands. Among the unusual attractions of this tiny island is the Channel Islands' only railway, composed of antique subway cars that saw earlier service on the London Underground. They were part of the Northern Line Centennial and still wear their 1920, Northern Line livery. The principal town is St. Anne. Sark is the smallest of the four main British Channel Islands. Three miles long and a mile and a half wide, it has a population of 550 and no motor cars. In fact one tractor-drawn ambulance is the island's only motorized vehicle. Sark was the last feudal state in Europe- maybe the world. Through 2007, it was governed by a Seigneur, appointed by the British monarch, and its legislators were landowners who had inherited the right to govern. Then, in August of 2006, the legislators voted to allow all of Sark's residents to stand for election and Europe's youngest democracy was born. The transition to full democracy took place in 2008. Surprisingly, given its tiny size and population, Sark has three hotels, about 10 B&Bs and a number of self-catering accommodations. Herm, a tiny islet three miles from Guernsey is part of the Guernsey bailiwick. Too small for independence, it is owned by Guernsey and has been operated, under lease, by the same family for three generations. This a place for really getting away from it all. The island's one hotel has no television, no telephones and no clocks. WiFi? What's that? Besides the hotel there are campsites, vacation rental cottages and a piazza of gift shops where you can buy anything from ritzy beachwear, toys and seaside fashions to the island's colorful stamps, issued until 1969. There are three further Channel Islands in the Bailiwick of Guernsey. Jethou and Brecqhou, which are privately occupied and not open to the public. Brecqhou is owned by the famously reclusive Barclay brothers, wealthy twins who own the London Telegraph. And last, Lihou is an uninhabited island off St Peter Port that is a wetlands bird sanctuary and the site of some neolithic ruins. It can be reached on foot at low tide over a cobbled causeway and can be visited on organized walks.